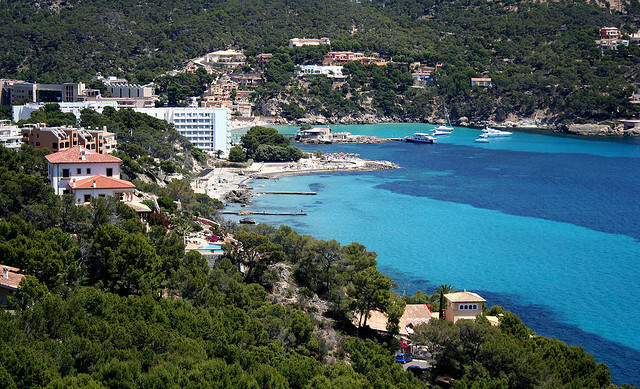 Camp de Mar is a secluded beach resort on Mallorca’s southwest coast which lies some 38km from Palma’s Son Sant Joan airport travelling via Palma’s ring road. The expected jorney time from the airport is only around 30 minutes but this may vary enormously depending on prevailing traffic conditions and your chosen mode of transport. It’s an ideal destination for family holidays when you really feel that you need to get away from it all. The resort is just off the main road between Paguera and Andratx and just 3km south of Port d’Andratx on a beautiful winding road through pine forests. There’s a small, sandy beach which is nicely sheltered from onshore winds and its shallow water and gentle waves are ideal if you’re travelling with young children. The eastern side of the beach is protected by the vertical walls of a rocky cove where you can gosnorkelling. To the west only rocks surround the sea but the views across the turquoise waters towards the villas of the rich and famous which overlook the bay are fabulous. A pedestrianised walkway allows for a pleasant stroll along the seafront. Fortunately the big tour operators haven’t made significant inroads into destroying this lovely corner of Majorca which has allowed Camp de Mar to hang on to a certain feeling of exclusivity. There are still only a handful of hotels occupied largely by independent British and German travellers but these are generally packed to the seams during the peak holiday season. If you do happen to book your holiday to Camp de Mar with an established tour operator they will no doubt include your transfer to the resort in the price they quote or will add on an additional fee for the transfer. Bearing in mind that the short journey to your hotel shouldn’t take much more than half an hour there are some tourists who complain about two hour journeys as they are the last ones to be dropped off after touring the hotels of nearby Paguera. You can of course take a taxi from the airport on arrival, prices may vary considerably but should be below 50 Euros. If travelling with young children be warned that baby seats are rarely available in street taxis. A far better option is to pre-book Palma transfers with a specialist shuttle company whose prices are usually comparable with taxis and you can inform them in advance if travelling with young children so they can have seats available. A popular alternative for many visitors to Mallorca is to hire a car before travelling and collect it at Palma airport. This often proves to be great value as the cost of the car hire covers your return airport transfers and gives you the flexibility to head out of Camp de Mar any time you fancy a trip out into the beautiful countryside of Mallorca. We’d strongly recommend Zest Car Rental when renting in Mallorca. Their rates are competitive, they allow for a free extra driver, operate a fair fuel policy and unlike less scrupulous operators they don’t hit you with a load of hidden extras when you come to pick up the car. The following map provides you with directions if your driving from the airport. Just head west towards Palma, take the city ring road (Circunvalación de Palma) then get on the Carretera de Palma – Palmanova (Ma-1). It’s a fairly straightforward drive. The few hotels which do exist in Camp de Mar tend to be of a reasonably high quality. I’d highly recommend the beachfront Grupotel Playa Camp de Mar which has a great pool and spectacular views over the bay. Their Thomson Holidays ‘Gold Medal Accommodation’ award is well deserved. The boutique H10 Blue Mar comes highly recommended as an adults only option. Another place we stayed on a whirlwind tour of the island was the Hotel Villa Real which is a budget 2-star option which we found very pleasant for a couple of nights. Booking.com features most available properties. A laid back resort with just a handful of hotels. Photo Credit: Cristian Bortes. The resort’s nightlife is fairly consistent with what you’d expect from a laid back family destination. There are no nightclubs, simply a few nice bars and restaurants together with the amenities provided by individual hotels. Restaurante La Illeta is well known for its unique location on a tiny island accessed by a wooden bridge from the beach. Worth a visit but hardly a culinary wonderland. For exquisite food book a table at the excellent Flor de Sal Restaurant which offers a lovely fusion of Mediterranean dishes and creative tapas on a lovely terrace with superb sea views. Watersports: If a short tour of the bay on a pedalo is your idea of watersports then Camp de Mar just might be the place for you. Apart from this and snorkelling the rocky coves there’s little else to distract you by day other than dedicated sunbathing. Golf: Golfers love to use the resort as a great base from which they can play the course at Golf de Andratx as well as having access to a number of other championship standard courses. 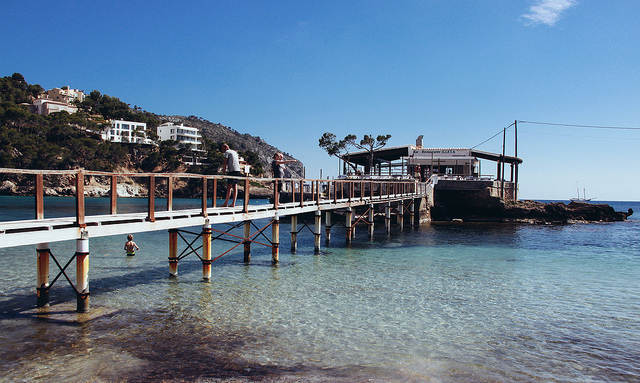 Boat Trips: There are boat trips in summer to the island of Sa Dragonera off Sant Elm departing from the wooden bridge which connects with the beach. Port d’Andratx: Take a short trip to this lovely port town and wander around the yachts in its marina as you wonder whether your lottery numbers have come up this week! Bus Routes: If you haven’t hired a car you can hop on one of the local buses connect many of the nearby resorts and offer frequent services into the city of Palma which is well worth a day out. 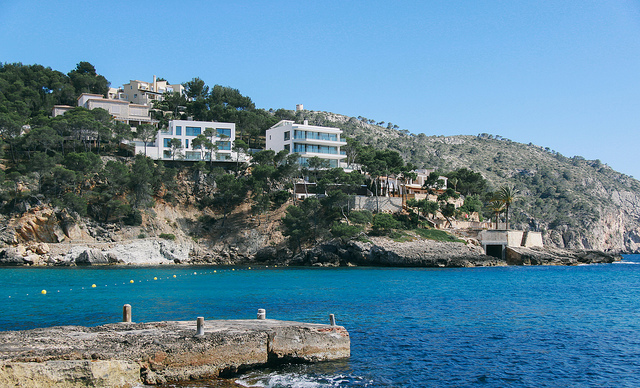 A personal favourite is to head out to Sant Elm for a paella lunch overlooking Sa Dragonera. Walking Trails: Ask your hotel receptionist to point out some of the local walking trails which are available on the outskirts of the resort. In the shade of the trees you can walk to Port d’Andratx or head for the ancient lookout tower which was built to provide advance warning of approaching pirates.